Swiss watch brand Victorinox Swiss Army watch presents a novelty Alpnach Black Ice Chronograph in a round 44mm stainless steel case with black PVD coating. Water-resistant - 100 meters. The case is equipped by a unidirectional rotating diver`s bezel. The black dial, enclosed by an antiglare sapphire glass, is equipped with hour indices, hands with luminescent coating, apertures day and date at the 3 o`clock positions, pointers at the 12, 6 and 9 o`clock position, and the tachymeter scale. On the back cover is also installed by a sapphire crystal, through which is possible to observe the work of the Swiss automatic movement ETA Valjoux 7750, 25 jewels, with a frequency of 28,800 vibrations per hour, 40 -hour power reserve, and functions of hours, minutes, seconds, date, day of week and chronograph. The watch comes on a black nylon strap with a buckle made of stainless steel with black PVD-coated. 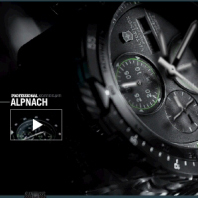 The new Alpnach Black Ice Chronograph is available at a price of 1,995 Euros. At the annual exhibition BaselWorld 2014, the Swiss watchmaker Victorinox Swiss Army will officially unveil the novelty Infantry Mechanical. The Swiss company Victorinox Swiss Army has very successfully moved from manufacturing of knives to the production of high-quality time meters, as can be clearly seen from the example of the new model Dive Master 500 LE Chronograph, which the company Victorinox Swiss Army presents at the annual exhibition BaselWorld 2014. The Swiss company Victorinox Swiss Army has developed an on-line watch catalog for Apple mobile devices in Russian. The Moscow Watch Expo exhibition by the company Victorinox Swiss Army will present a new collection Victorinox Swiss Army Chrono Classic 1/100. The watch brand Victorinox Swiss Army has introduced new multi-colored models, which have become complementary to the Maverick collection. In this case, new items keep the same proportions and shape as the previous models of the collection. Swiss watchmaker Victorinox Swiss Army at the international exhibition of watches and jewelry BaselWorld 2013 has unveiled a novelty Chrono Classic 1/100th. In October 9, 2012, the new website Victorinox Swiss Army - nightvision.victorinox.com began to work. It was created by the company and dedicated to the release of the update collection of the multifunctional watch Night Vision. The Swiss watch company Victorinox Swiss Army announces the release of a new model - Infantry Mechanical. This is a so-called "infantry" watch, which was first presented at BaselWorld 2012. The Swiss watch company Victorinox more than 125 years is engaged in development and production of multi-tools and knives, including the famous Original Swiss Army Knife. The new men's watches Airboss Power Gauge by the Swiss company Victorinox. The model has an indicator of the power reserve at the 7 o’clock position, as well as a date window with the date at the 3 o’clock position. Swiss watch company Victorinox Swiss Army was founded in 1884 by Carl Elzener. First workshop of Victorinox specialized on production of knives for Swiss army. In 1989 company enlarged its activity and began to produce watches. The Swiss watch brand Victorinox Swiss Army delighted the fans of diving watches by the new model Alpnach Black Ice Chronograph, designed in classic sports style. The round watch case in diameter of 44 mm is made of stainless steel and coated with PVD-coating in black.